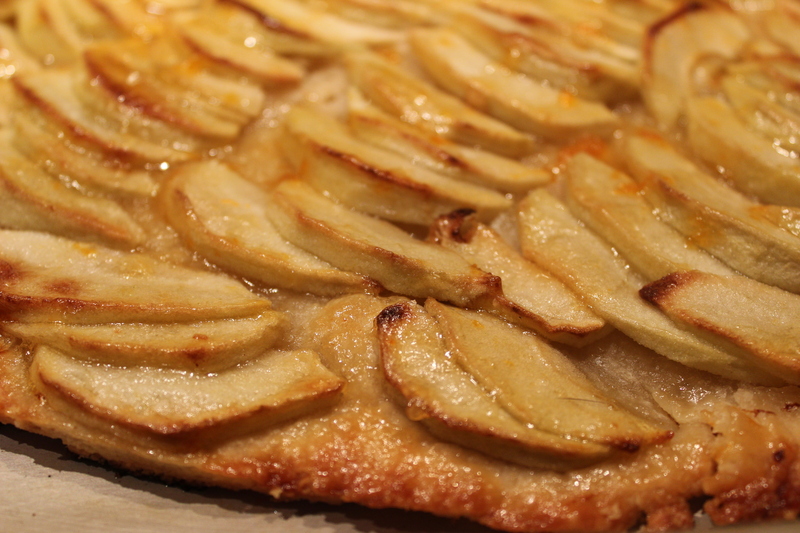 I think it all started with Sunday night – I made a French Apple tart that I had never made before – Yummy and Easy! Roll the dough slightly larger than 10 by 14-inches. Using a ruler and a small knife, trim the edges. Place the dough on the prepared sheet pan and refrigerate while you prepare the apples. Peel the apples and cut them in half through the stem. Remove the stems and cores with a sharp knife. Slice the apples crosswise in 1/4-inch thick slices. Place overlapping slices of apples diagonally down the middle of the tart and continue making diagonal rows on both sides of the first row until the pastry is covered with apple slices. Sprinkle with the full 1/2 cup of sugar and dot with the butter. Bake for 45 minutes to 1 hour, until the pastry is browned and the edges of the apples start to brown. Rotate the pan once during cooking. If the pastry puffs up in one area, cut a little slit with a knife to let the air out. Don’t worry! The apple juices will burn in the pan but the tart will be fine! When the tart’s done, heat the apricot jelly together with the Rum and brush the apples and the pastry completely with the jelly mixture. Loosen the tart with a metal spatula so it doesn’t stick to the paper. Allow to cool and serve warm or at room temperature. – this is a recipe I found online that is Ina Gartens – I love her!!! Monday was Ribeye Steak, Mashed Potato, Mushroom Gravy and Asparagus – I think I mentioned before that I am not a fan of Mushrooms! SO my way of “hiding” them was to chop them as small as I possibly could; the gravy was SO delicious that I couldn’t NOT eat it. I was told after dinner that “we can have that more often” Ya I’ll get right on it! My son likes Mushrooms and hates asparagus – which was why I made both – take that!!!! Tuesday I got up early and threw a beef stew together – I will even admit; it was the best one I made in a crockpot, Hands down! Wednesday nightI tried another new recipe. I had harvested my Leeks among other things and had tore one away from it’s root so I wanted to use it up quickly. I found a recipe online that used the leeks, pancetta which I had in the fridge and chicken stock that I am never without; whether it is my own or from the store. Make some pasta, saute leeks and pancetta add wine and stock and add it all together and cover it with Parmigiano Reggiano Voila! The “On Fire” comment was when he was getting ready to take me out to dinner on Friday! I will confess that I was less successful with the dropped eggs on toast Friday morning – Note to self; when poaching eggs. DO NOT leave the kitchen for ANY reason!!! 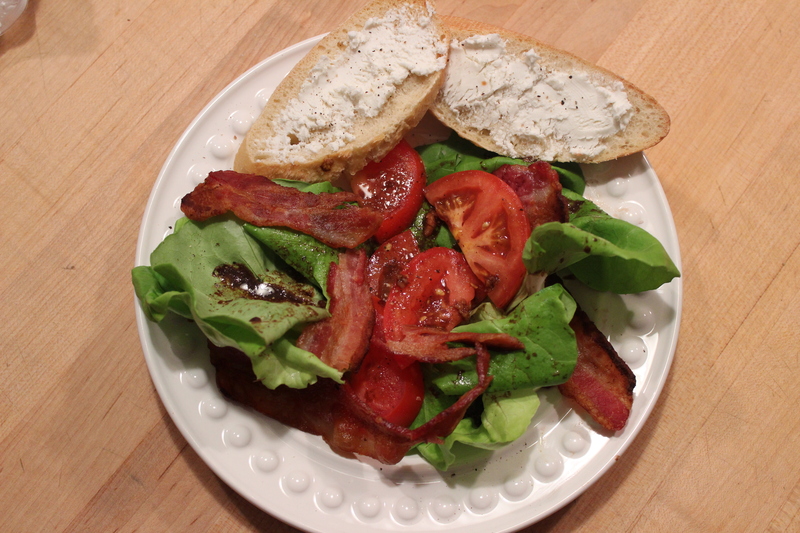 I ended my week night cooking (we usually go out to dinner on Friday nights) with a new recipe I found in a magazine Deconstructed BLT – This one is a keeper!!! Top salad with bacon and baguette slices. Sprinkle with additional black pepper is desired. Makes 2 servings – I doubled it as there were 4 of us! 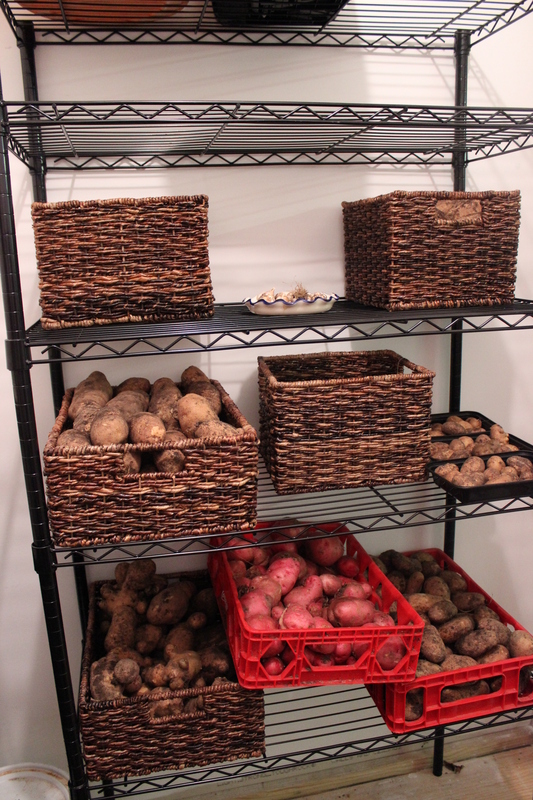 My husband did harvest his potatoes this week – He got an entire wheelbarrow full AND was disapointed it wasn’t more. Who is trying to fatten up who here! I love potatoes and of course me being me, I don’t want anything to spoil so I must use them up! I did go out and purchase a rack system and some baskets (KP we didn’t get enough last night) to hopefully make them last for MONTHS!!! He did have a few ummmmm mutant ones (see last photo) that I won’t bring out for my cooking class or bring out when friends come over to make dinner…BUT we will still eat them! It HAS to be the weather; it being so cool and this weekend kind of drizzly – I made a Roaster Chicken for dinner tonight – Swedish Meatballs, Italian Meatballs and Marinara Sauce for later in the week. This weekend was filled with putting aways screens, summer cars, (my 89′ Mustang GT Convertable, he has a 85′ SVO) washing windows, deep down and dirty cleaning, washing walls and the risers on the stairs – you get the picture. Oh Ya and lots of cooking!!! Next weekend my Garlic is going in!!! Golf weekend, leaf peeping and a quick yummy dinner!